MIAMI, FL – December 5, 2012 – The Miami Dolphins announced today an official partnership with Miami-based Burger King Worldwide, Inc. (NYSE: BKW) in support of their new home delivery service, BK® Delivers. In honor of the recently expanded BK® Delivers program to South Florida, and the holiday season,former Miami Dolphins legend Zach Thomas made special appearances around South Florida bringing meals to local service organizations. 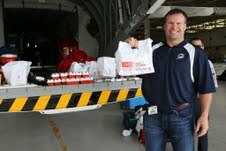 Earlier this week, Thomas visited Coast Guard Air Station Miami at Opa-Locka Executive Airport to deliver special BK® menu items to Air Force pilots and other military personnel. 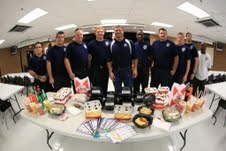 Thomas also paid visits to the city of Plantation and Ft. Lauderdale fire departments on his goodwill delivery tour. These “special deliveries” kickoff a limited-time promotion where BK® Delivers customers are entered into a giveaway for the chance to win a pair of 2013 Miami Dolphins season tickets each week simply by placing a qualifying delivery order online. The promotion is offered now through January 4th, 2013. Please visit www.BKDelivers.com/Dolphins for more details and Official Rules. The Miami Dolphins, owned by Chairman of the Board/Managing General Partner Stephen M. Ross, currently play in the AFC East of the National Football League. The organization has played in five Super Bowls, winning championships in 1972 (VII) and 1973 (VIII). The franchise also has won five conference championships and 13 division championships and is the oldest continuous major-league professional sports franchise in the state of Florida. For more information, visit the organization’s website at dolphins.com. Founded in 1954, BURGER KING® (NYSE: BKW) is the second largest fast food hamburger chain in the world. The original HOME OF THE WHOPPER®, the BURGER KING® system operates in over 12,600 locations serving over 11 million guests daily in 83 countries and territories worldwide. Approximately 95 percent of BURGER KING® restaurants are owned and operated by independent franchisees, many of them family-owned operations that have been in business for decades. To learn more about Burger King Worldwide, please visit the company’s website at www.bk.com or follow us on Facebook and Twitter.